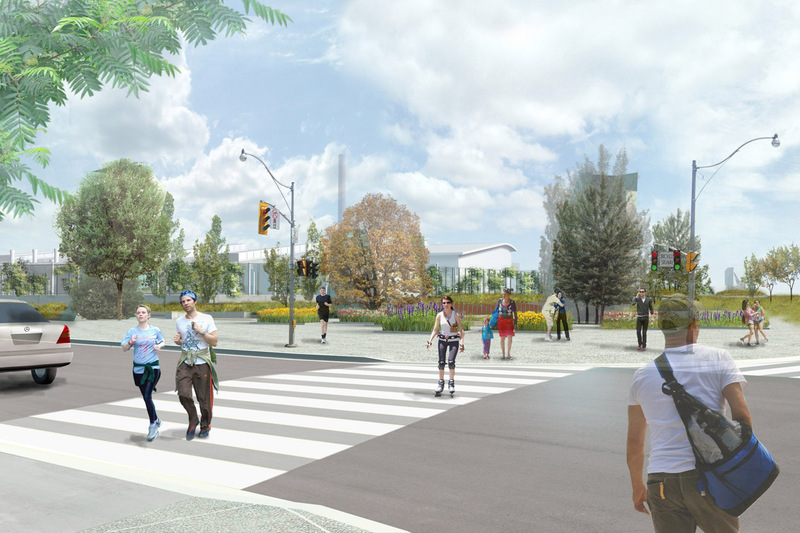 The Ashbridges Perimeter Landscape will add public space and improve the Martin Goodman Trail, seen here looking north on Leslie St. towards Lake Shore Blvd. 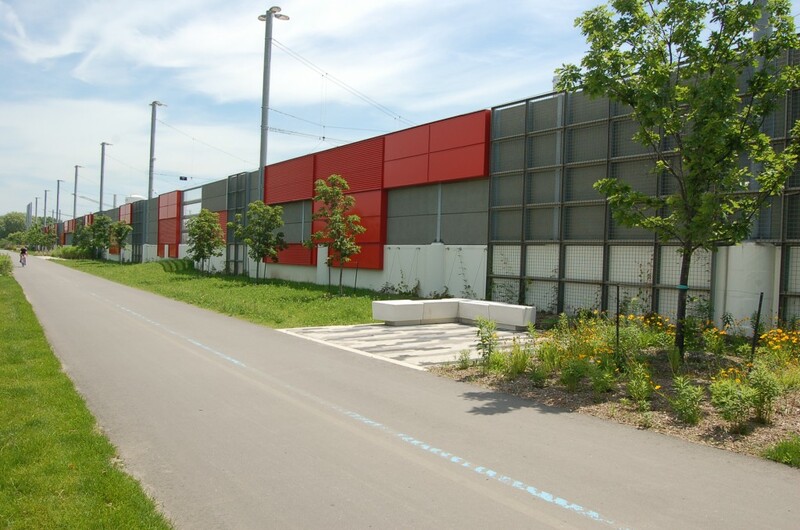 The TTC is constructing the Leslie Barns, a streetcar maintenance and storage facility, in preparation for the 2014-2015 entry into service of more than 200 new LRVs. 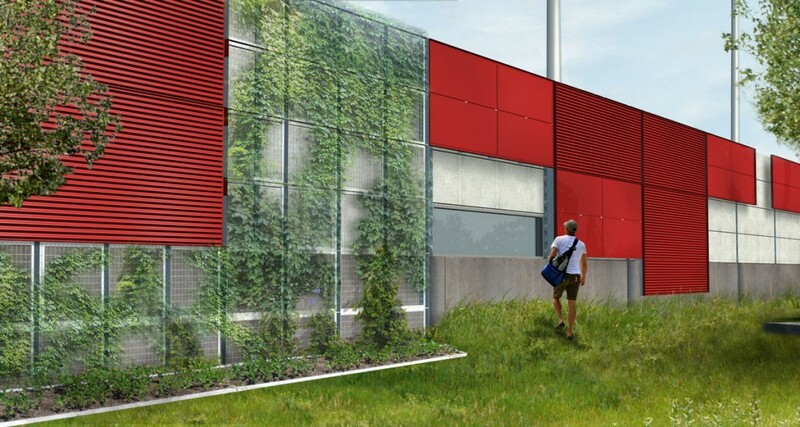 A red frieze wall combines coloured patterns and trellises for climbing vines in order to create a running pattern of visual interest and an ecologically useful edge. 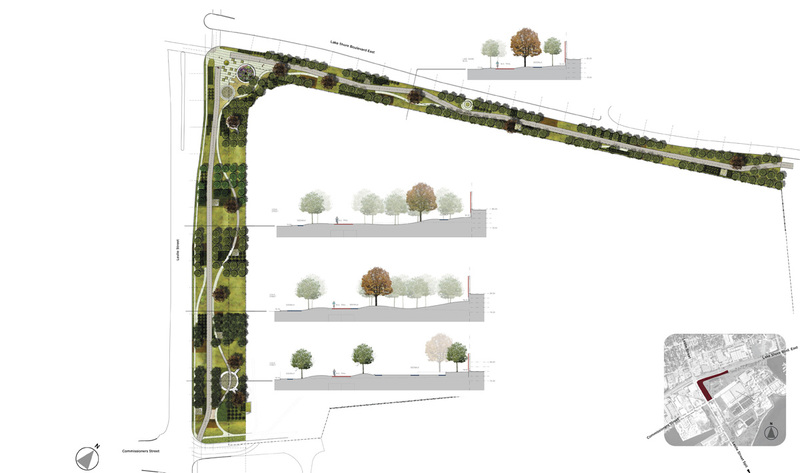 The project has expanded to carry streetscape improvements and greening from the original perimeter north on Leslie Street to Queen (as seen in this plan), as well as south on Leslie to Unwin Avenue (not shown). 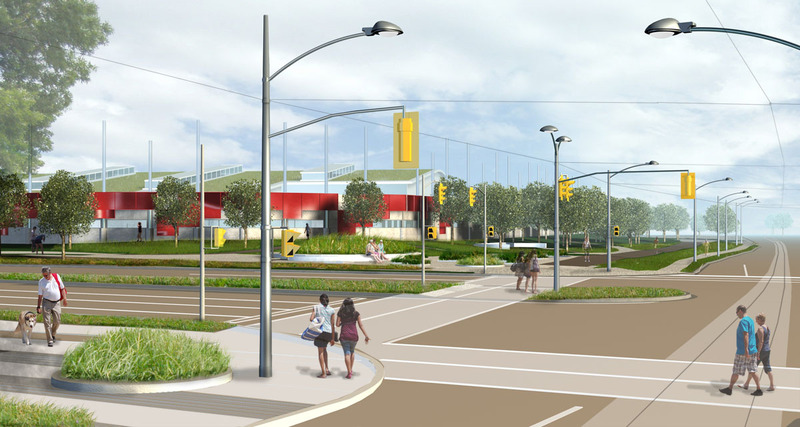 Brown + Storey Architects Inc. was the winner of a 2010 competition to design a perimeter landscape and linear park to surround the new TTC Streetcar Maintenance and Storage Facility near Leslie Street and Lake Shore Boulevard, opening in 2015. 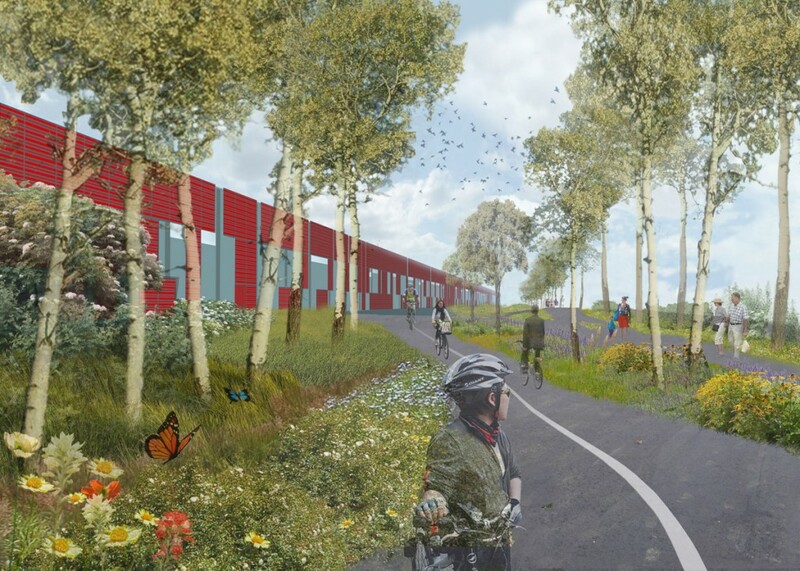 The landscape and additional public open space will mitigate impacts from the new facility, including an acoustic barrier, on area residents and on users of the Martin Goodman Waterfront Trail which runs along the two public sides of the site. 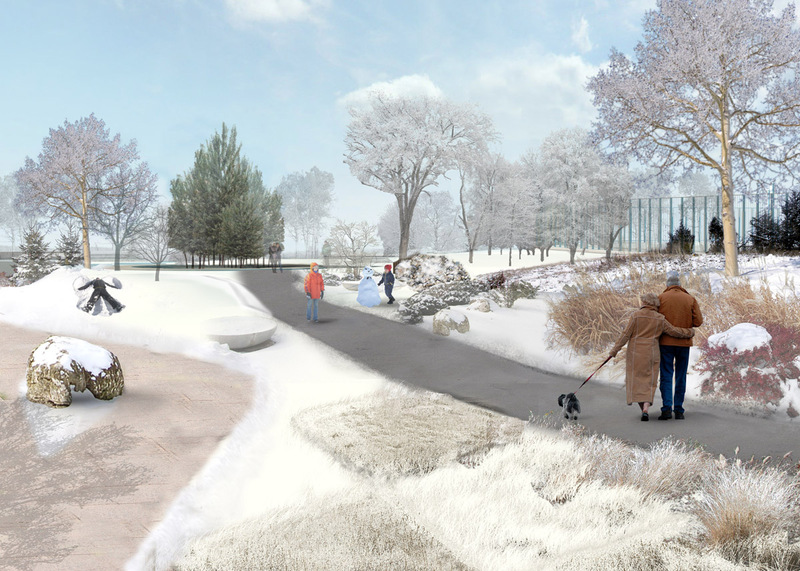 The landscape will improve the space and aesthetic quality of the Martin Goodman Trail, and introduces new amenities including footpaths, seating areas and extensive new native plantings organized to provide combinations of dense growth and open clearings along the length of the trail. 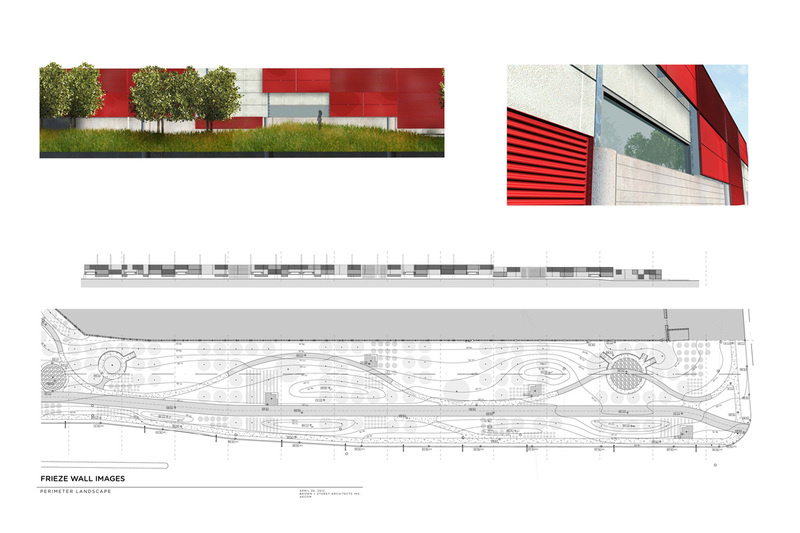 A red frieze wall is a main component, creating a visual running pattern of interest for the site and provides a medium for growing plants on the vertical surface. 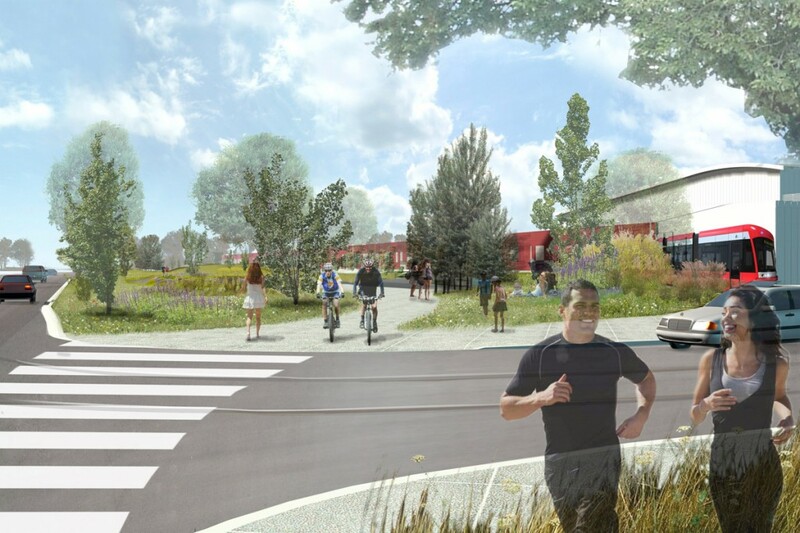 After the initial competition, the project has been expanded to carry streetscape improvements and greening up Leslie Street to Queen Street (where the new streetcars will turn to enter service), and south on Leslie to Unwin Avenue and the famed Leslie Street Spit. 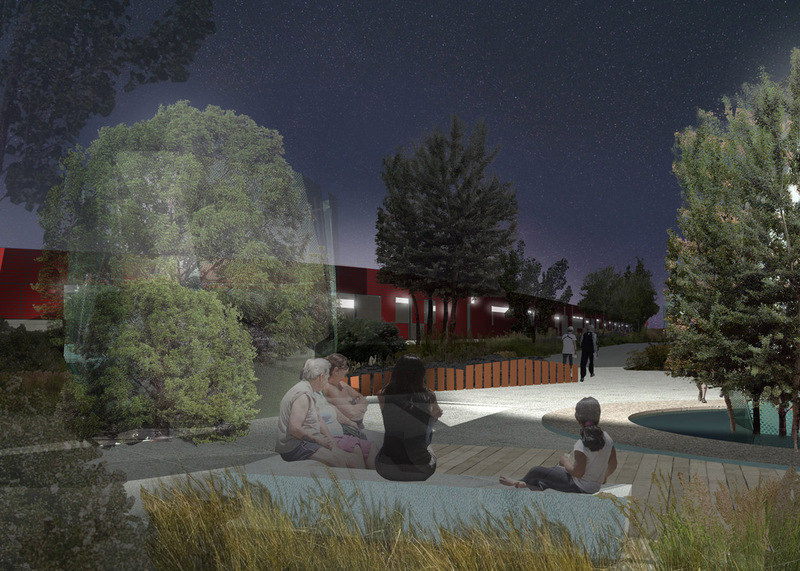 Brown+Storey has provided urban design details to unify this district and use an infrastructure investment to strengthen the neighbourhood’s pedestrian realm. 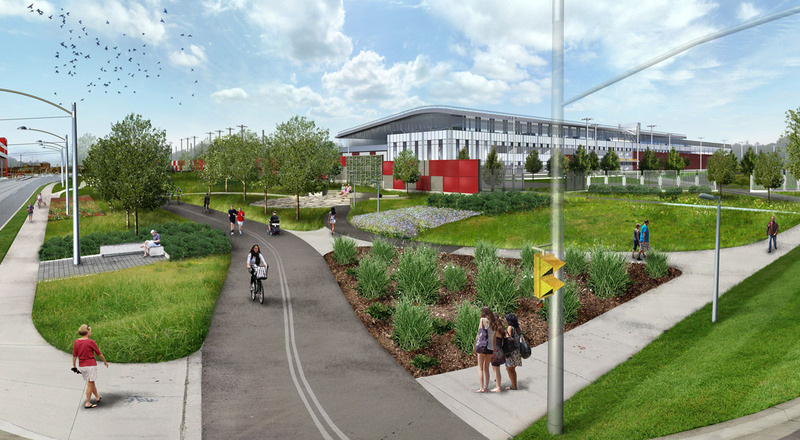 The Toronto Transit Commission is building a new streetcar maintenance and storage facility at Leslie Street and Lake Shore Boulevard in Toronto, on lands abutting both the Ashbridges Bay Wastewater Treatment Plant and the Martin Goodman Waterfront Trail. 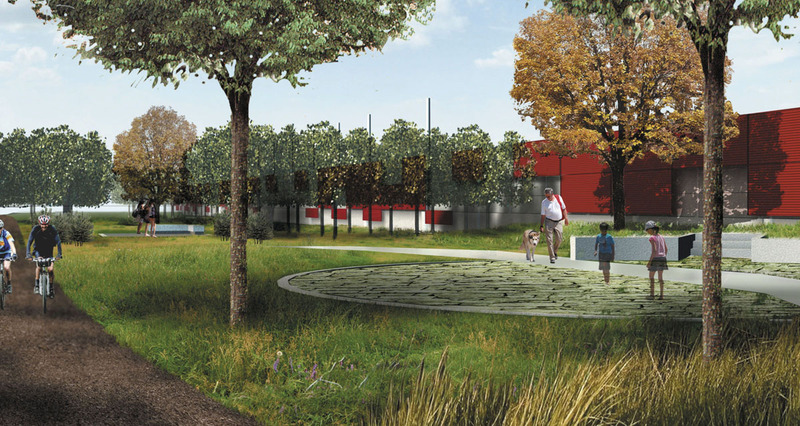 A perimeter landscape and linear park are being installed along Lake Shore Blvd and Leslie St. to mitigate impacts from the new facility, including a noise barrier. 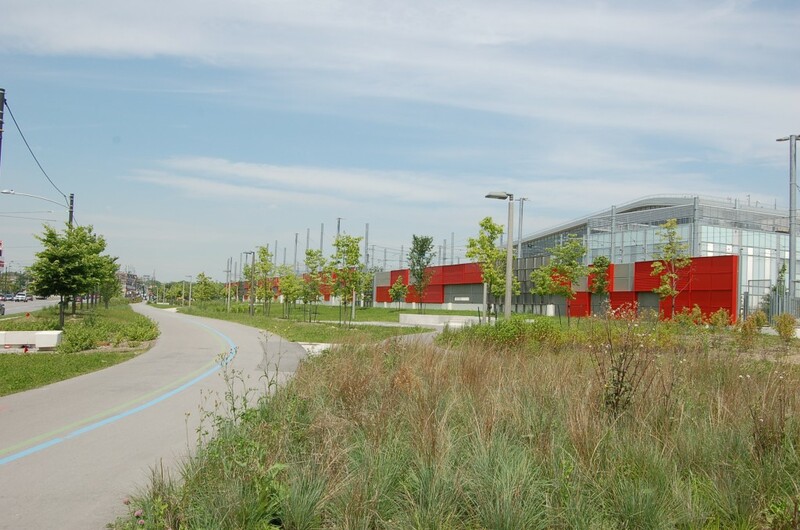 A competition held by City of Toronto, Urban Design in 2010 shortlisted three firms to prepare public concept proposals for the linear park and streetscapes; Brown+Storey Architects won the competition, and was awarded the urban design and landscape contract joined by Scott Torrance Landscape Architect. 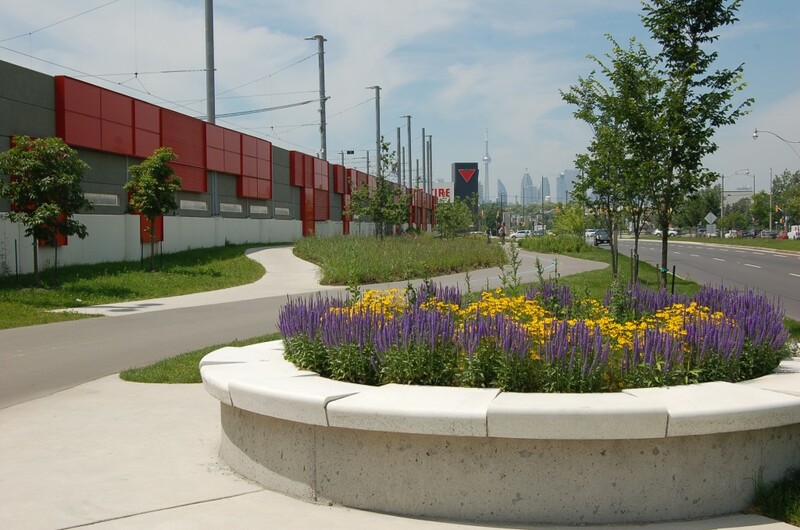 The project’s scope has been expanded to include streetscape improvements and greening on Leslie Street north to Queen and south to Unwin Avenue. The project now includes urban design improvements at all four corners of the Leslie-Lake Shore intersection.